Archives, in their many forms, save information from today that people will want to access and study in the future. This is a critical function of all archives, but it is especially important when it comes to storing data from today’s modern telescopes. NASA’s Chandra X-ray Observatory has collected data for over sixteen years on thousands of different objects throughout the universe. Once the data is processed, all of the data goes into an archive and is available to the public. To celebrate American Archive Month, we are releasing a collection of new images from the Chandra archive. 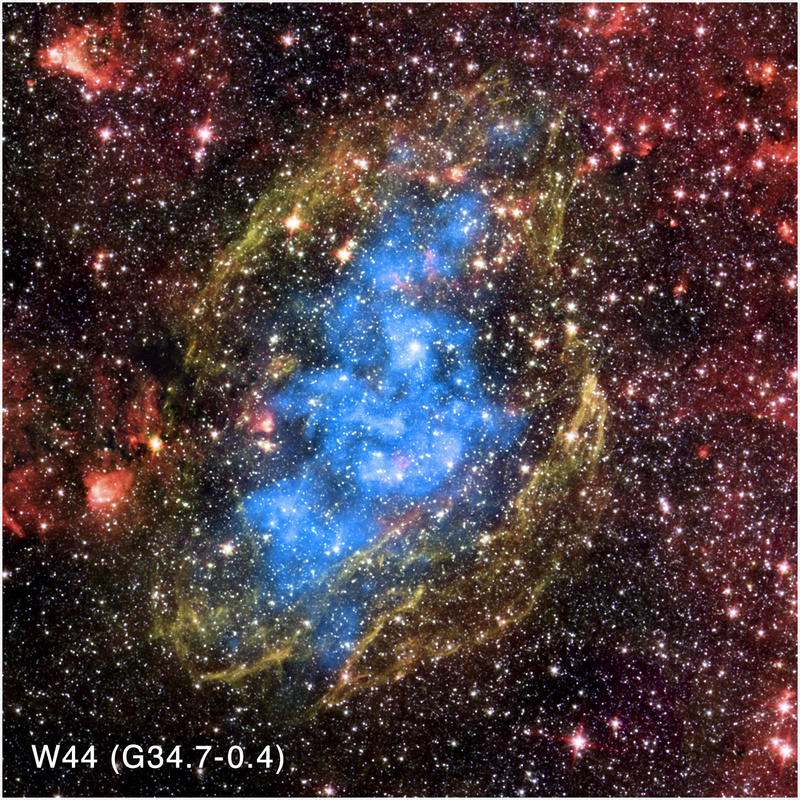 W44: Also known as G34.7-0.4, W44 is an expanding supernova remnant that is interacting with dense interstellar material that surrounds it. X-rays from Chandra (blue) show that hot gas fills the shell of the supernova remnant as it moves outward. Infrared observations from the Spitzer Space Telescope reveal the shell of the supernova remnant (green) as well as the molecular cloud (red) into which the supernova remnant is moving and the stars in the field of view. SN 1987A: First seen in 1987, this supernova (dubbed SN 1987A) was the brightest supernova and nearest one to Earth in the last century. In a supernova explosion, a massive star runs out of fuel then collapses onto its core, flinging the outer layers of the star into space. By combining X-ray data from Chandra (blue) with optical data from the Hubble Space Telescope (appearing orange and red), astronomers can observe the evolution of the expanding shell of hot gas generated by the explosion and watch as a shock wave from the blast heats gas that once surrounded the doomed star. 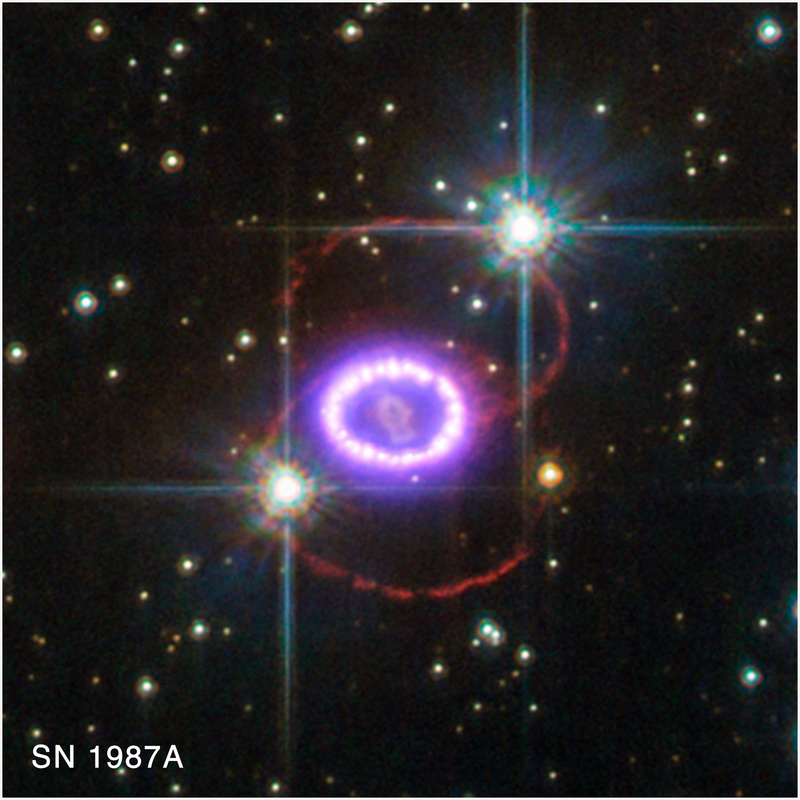 The two bright stars near SN 1987A are not associated with the supernova. 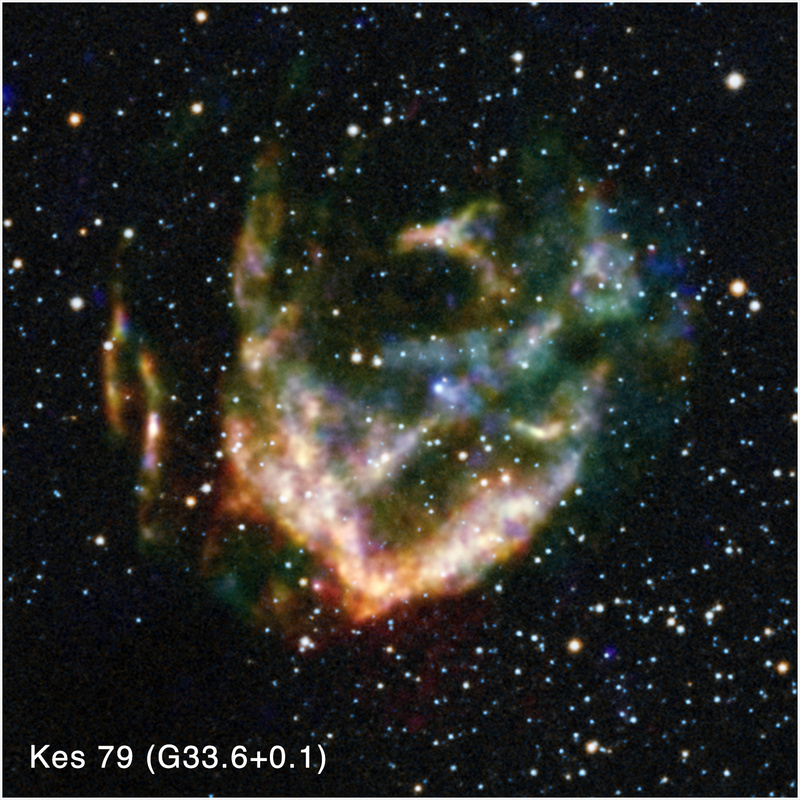 Kesteven 79: Like SN 1987A, this object, known as Kesteven 79, is the remnant of a supernova explosion, but one that went off thousands of years ago. When massive stars run out of fuel, their cores collapse, generating a shock wave that flings the outer layers of the star into space. An expanding shell of debris and the surviving dense central core are often heated to millions of degrees, and give off X-rays. In this image of Kesteven 79, X-rays detected by Chandra (red, green, and blue) have been combined with an optical image from the Digitised Sky Survey of the field of view that reveals the stars (appearing as white). MS 0735.6+7421: The galaxy cluster MS 0735.6+7421 is home to one of the most powerful eruptions ever observed. X-rays detected by Chandra (blue) show the hot gas that comprises much of the mass of this enormous object. Within the Chandra data, holes, or cavities, can be seen. These cavities were created by an outburst from a supermassive black hole at the center of the cluster, which ejected the enormous jets detected in radio waves (pink) detected the Very Large Array. These data have been combined with optical data from Hubble of galaxies in the cluster and stars in the field of view (orange). 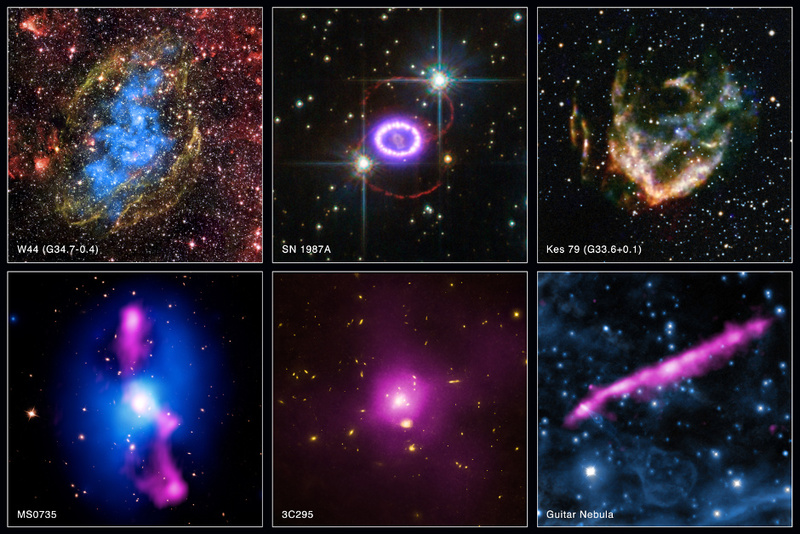 Image credit: Chandra X-ray Center. 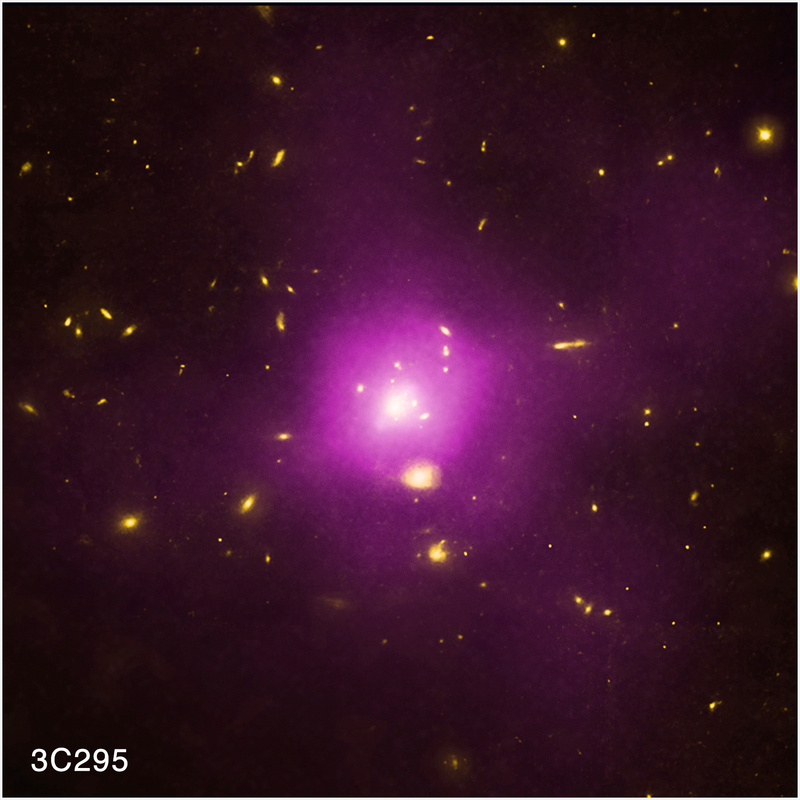 3C 295: The vast cloud of 50-million-degree gas that pervades the galaxy cluster 3C 295 is only visible with an X-ray telescope like Chandra. 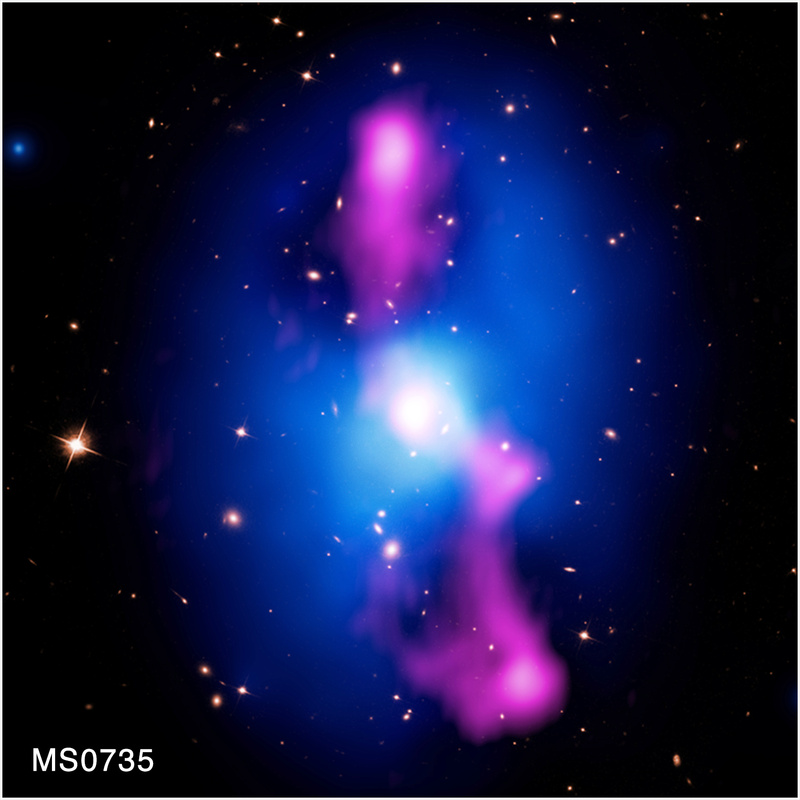 This composite image shows the superheated gas, detected by Chandra (pink), which has a mass equal to that of a thousand galaxies. Hubble’s optical data (yellow) reveal some of the individual galaxies in the cluster. Galaxy clusters like 3C 295 also contain large amounts of dark matter, which holds the hot gas and galaxies together. The total mass of the dark matter needed is typically five times as great as the gas and galaxies combined. Guitar Nebula: The pulsar B2224+65 is moving through space very rapidly. Because of its high speed, the pulsar is creating a bow shock in its wake. This structure is known as the Guitar Nebula and the likeness of the musical instrument can be seen in the optical data (blue) of this composite image taken by Hubble and the Palomar Observatory. 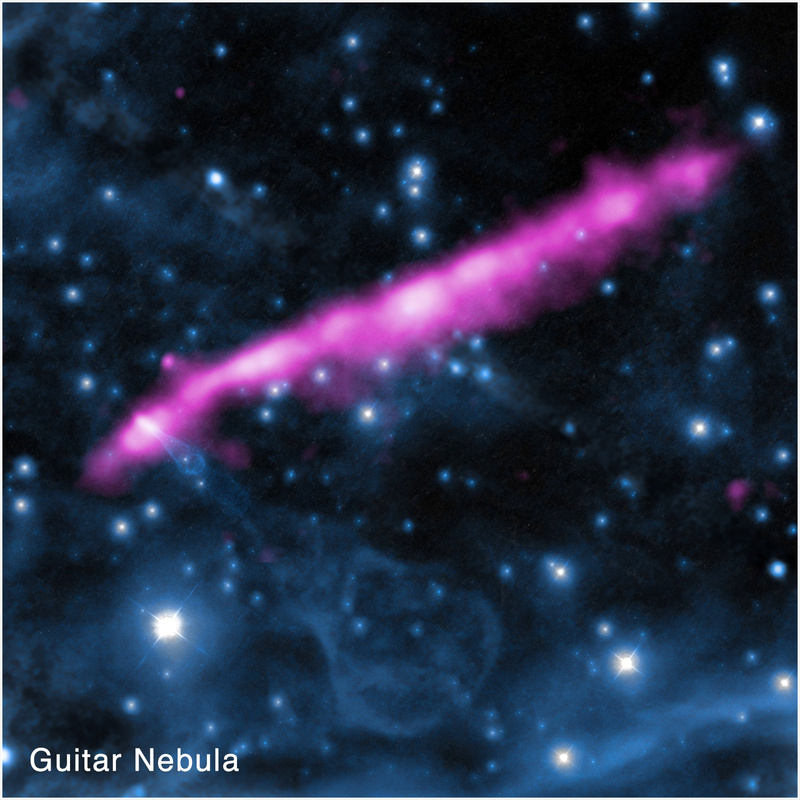 X-ray data from Chandra (pink) reveal a long jet that is coincident with the location of the pulsar at the tip of the “guitar,” but is not aligned with its direction of motion. Astronomers will continue to study this system to determine the nature of this X-ray jet.